Much of the platforming genre is based on nostalgia: nostalgia for games like Super Mario World, Donkey Kong Country or Sonic the Hedgehog. These titles dominated consoles and earned themselves legions of fans along the way. An entire sub-set of mobile games is based around recreating that magic, especially when it comes to gameplay. Pizza Boy is one of those titles. Its premise is simple, like most games of its type tend to be: you're a pizza delivery boy looking to get a particular pie back from a bird who has stolen it. In order to retrieve it, you'll be traversing a number of levels by running, jumping and throwing bottles as projectiles. It's a simple idea, and an effective one - really, do we always need something deep and meaningful to get us hooked? The game's look at feel is based upon the 16-bit era. The graphics are pixelated, but detailed enough not to look sloppy. Extra care has been put into the animation of the objects so that they look smooth, similar to the Xbox 360/PS3 game Scott Pilgrim vs. 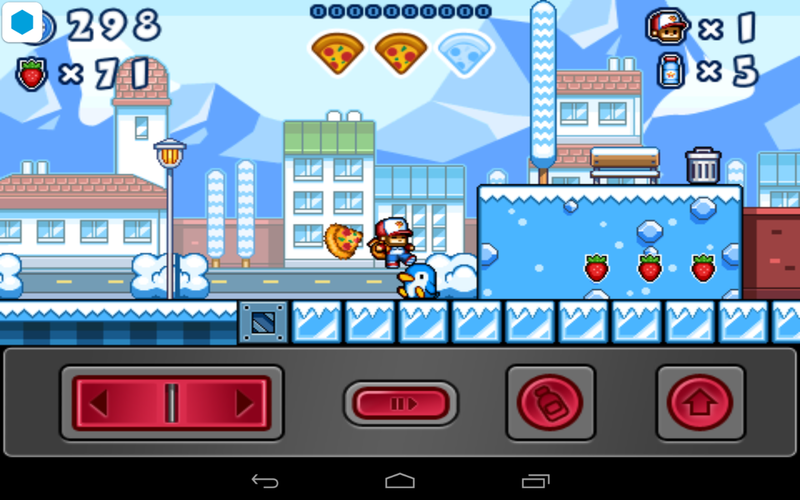 The World; while many games may hide behind low-resolution graphics as a way to seem ironically dated, Pizza Boy looks polished while improving on what came before. Music-wise, the listener will be treated to a healthy chiptunes soundtrack which feels in line with what we'd come to expect from a SNES or Genesis game. Pizza Boy makes a big deal out of allowing you turn off the game sounds even before you start playing, so non-fans can spare their ears if desired. 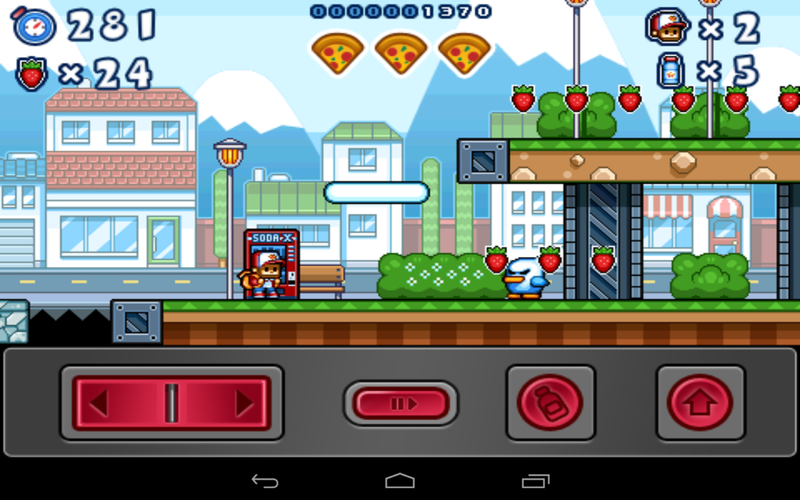 When it comes to presentation, there are only a few quibbles that keep me from fully enjoying Pizza Boy. 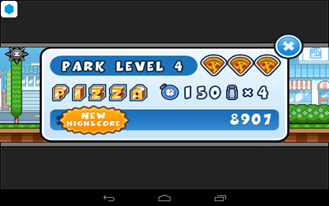 It seems to have some issues in scaling where it didn't look the best on my Nexus 7. Certain scenes looked particularly stretched out, especially the title menu; this will likely be less noticeable on phones, however. Other than that optimization shortfall, there's little I found fault with; the game itself looks good, and that's what counts. The most important part of a platforming game is the controls. Without them, you're robbing your players of a core mechanic that is integral to their entire time spent with the game. If a player cannot jump, move, and land efficiently, how are they to be expected to navigate your complex levels? 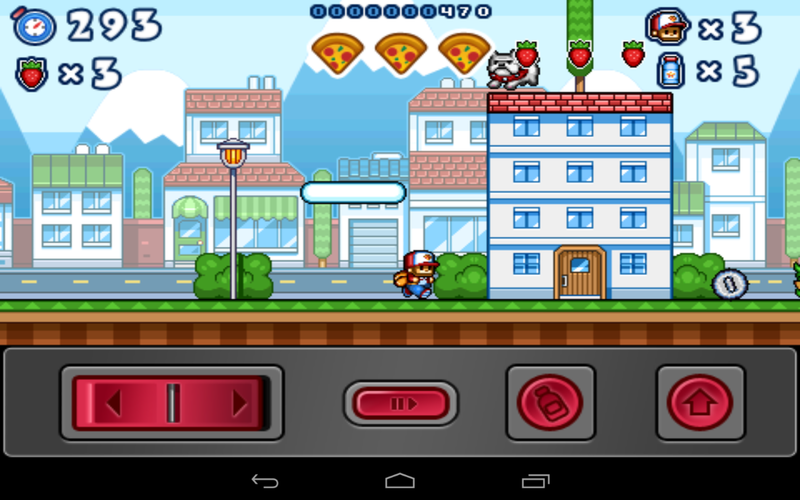 Paper Boy's controls look a bit simplistic at first, due to the design of the virtual buttons. The left/right movement is controlled by a virtual rocker switch, while the ranged attack and jump functions are mapped to two other buttons on the right side. 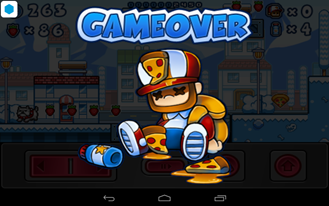 On-screen controls are traditionally hit-or-miss; thankfully, Pizza Boy's manage to avoid this problem by fostering precision. This game could have easily kept the two buttons for jump and attack and added a draggable joystick - however, the rocker switch is simple enough that it doesn't confuse players. In limiting players by saying "here's four buttons that each do a different thing" and putting them all on the screen at once, the developers gave them agency; they know their capabilities, and it's up to the player to use them effectively. Like any game, though, it may take some time to get used to how practical the controls are. During gameplay, there are a few hitbox issues (especially with some fast moving enemies) that may result in lost health. Many attempts to jump on top of baddies ended in a smaller life meter, but eventually, you learn what will be successful and what won't. 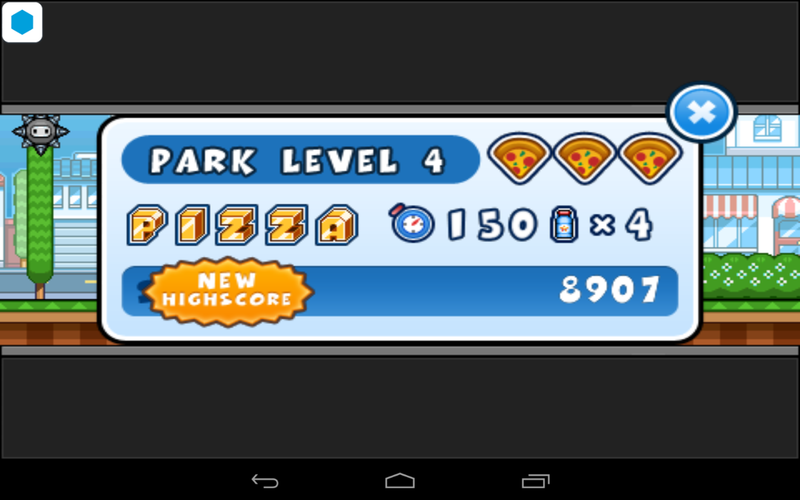 When it comes to platforming, however, Pizza Boy sets a good standard. There was a moment where I was playing through one of the game's self-scrolling levels when I realized that the game's controls were so good that I wasn't worried about tripping over them. Especially in moments where time is of the essence, this game won't fail you. 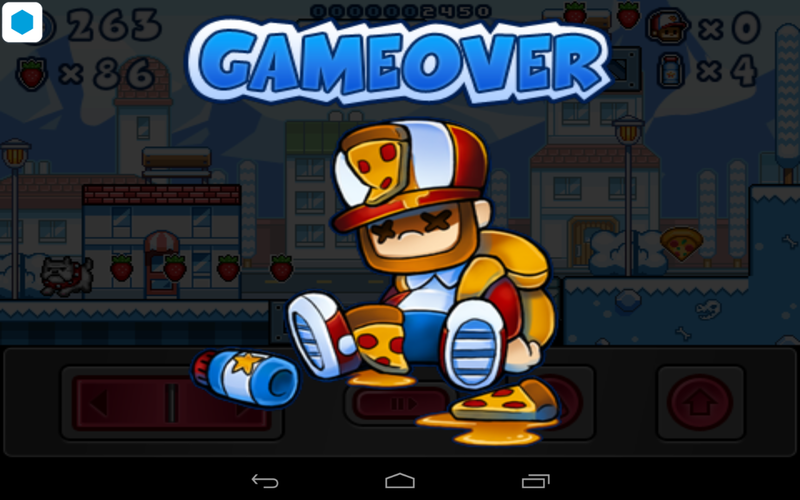 I was pleasantly surprised by Pizza Boy. When I originally picked it up, I had a jaded feeling that it would be like so many other retro platformers: lacking simplicity and polish. However, this title has both, and - more importantly - enough of the latter to keep you wanting to play the game. You can tell that a great amount of work went into making this game unique without forgetting its roots: sometimes it may be difficult to play the nostalgia card without someone saying "yeah, it's Mario with a different skin." 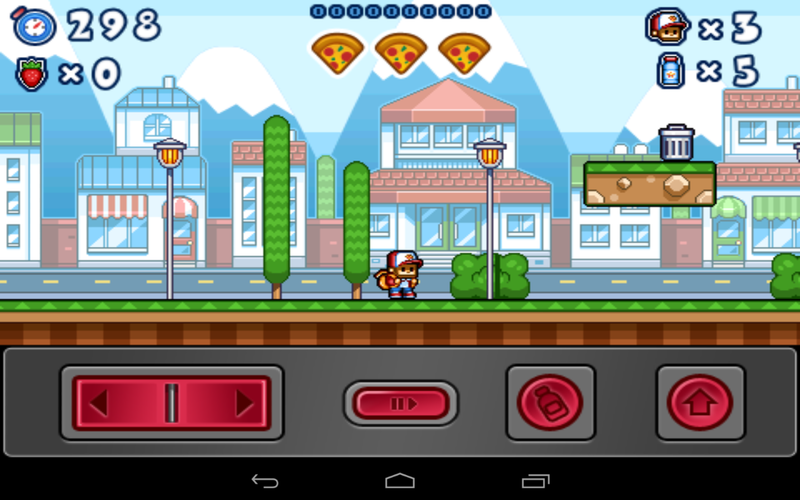 Game developers who grew up playing titles they now take inspiration from them can look to Pizza Boy as a great example of a game done right. There are minute things that keep it from being absolutely perfect, but its low price, in-game graphics quality, and functional controls make it a winner.